One evening a few weeks back, I started to develop some palpitations - rather poor timing as I had just left work! 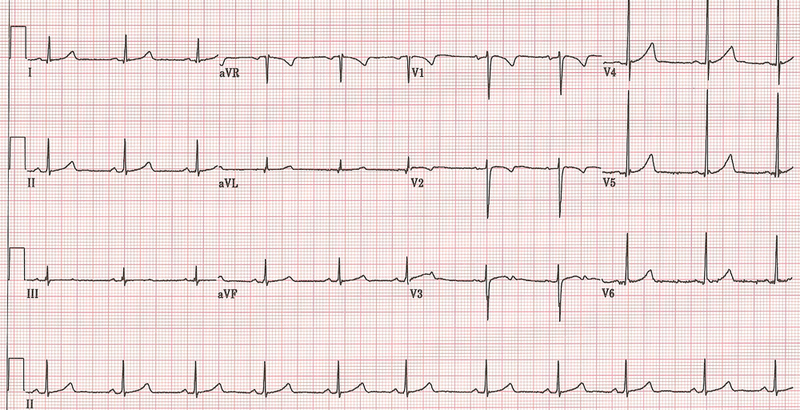 What are palpitations exactly? Well, it's when your heartbeat becomes far more noticeable. It can be a normal speed, but palpitations can also be very quick. Not only this but sometimes they can be regular in their rhythm, or irregular without any pattern to the beats. Along with the heartbeat being much more noticeable, palpitations can give people a very uncomfortable feeling - and despite explaining this to people countless times, I don't really think I fully appreciated it until a few weeks ago. It was a fairly nauseating sensation, with a real tightness and squeezing sensation across my upper chest, going all the way up into my neck. Mine were a normal rate, but they lasted a good few hours before gradually disappearing. ECG (electrocardiogram) - these are tracings of the heart - the ones you always see on monitors in medical dramas! They are an excellent way of getting a snapshot of how well your heart is conducting the electrical signal the stimulates each beat. It also checks the speed of the heartbeats and can check if the beats are regular or irregular. Echocardiogram - check out the images below! These are short clips of my actual scan and my heart beating in real time. This is basically an ultrasound of the heart, so no radiation is involved. It lets us see the structure of the heart, the valves and all the associated structures in minute detail. It also lets us see blood flowing through the heart, so this allows us to make sure the heart is functioning as it should be. Bardy 7 day event monitor - whilst an ECG gives you a snapshot - your heart may be going in and out of a funny rhythm, which is causing the palpitations so the ECG might miss it. The Bardy is an ingenious little device - it sticks onto your chest and stays there for 7 days. If any further events happen during this time, it will pick up on them and all the data is analysed by the cardiologists at the end of the 7 day period. It's shower-proof and pretty unobtrusive to be honest. After all of this, I was delighted to get normal results. Whilst a part of you (as both a doctor and a patient) wants something to turn up in the tests, something to explain everything that is easily fixable, ultimately I was reassured that all was well. Often with tests in medicine this is the way - we do a complete battery of tests and rule out a lot of things, but sometimes can't give a definitive answer as to what exactly caused things. This is the case here, so whilst I can speculate on the cause, it was a huge relief that structurally, and electrically my heart is working fine. The process of having all of these tests done was a pretty fascinating one, and despite sending numerous patients for such tests, it's always a bit nerve-wracking being on the receiving end of them (despite trying to be very rational about it all). I can't praise the guys at One Heart Clinic enough for being so efficient, reassuring and caring every step of the way. The One Heart Clinic is a state-of-the-art cardiac diagnostics and cardiology centre run at 27 Harley Street - visit their website here to read more about the consultants and their excellent service.